Printed in: The Fell, The Quaker Community of Haverford College, Haverford, PA, Winter 2011. 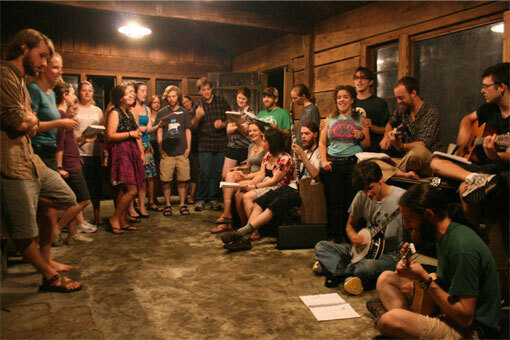 The Quaker Community of Haverford College (QuaC) hosted sixteen students from Earlham College and George Fox University in September 2010 for a weekend of bonding and networking. Ten Earlham students drove to Haverford from Richmond, Indiana, and six students flew in from George Fox University in Newberg, Oregon, as part of a program aimed at strengthening ties among Quaker colleges. 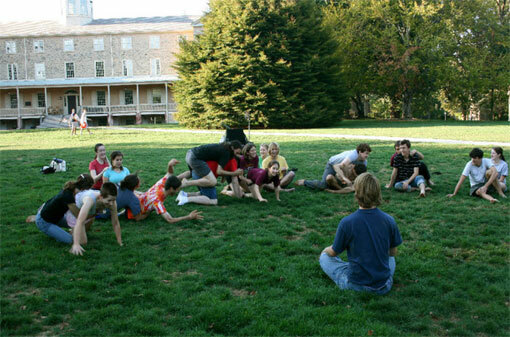 Haverford students started this intervisitation program in the spring of 2009 to foster and nurture relationships between students at Quaker and Quaker-rooted colleges and universities around the country. Since that time, and with a grant from the Thomas H. and Mary Williams Shoemaker Fund of Philadelphia Yearly Meeting, Haverford students have organized trips from and to Earlham, George Fox, and Guilford College in Greensboro, North Carolina. The weekend in September was the first time that this program brought students from three colleges together. Past gatherings had only included students from Haverford and one other school. It was also the first time that the program brought three branches of Quakerism – Unprogrammed, Evangelical, and Pastoral – together. I am a sophomore at Haverford, and when I came here as a freshman in the fall of 2009, the intervisitation program was already underway. The spring before I got here, some Haverford students went down to Guilford College to participate in a larger Adult Young Friends Gathering. That October, students from Guilford came up to Haverford for a weekend. Unfortunately, I was unable to attend the Friday and Saturday events, but I remember coming to QuaC’s Meeting for Worship that Sunday and recognizing people who I knew from Friends General Conference (FGC) gatherings. At times like that one, I really see how small Quaker circles are. The following month, Haverford students organized a trip to Earlham. I went on that trip. Before we left, I remember commenting that, although I had never been to Earlham before, I felt like I had been, because I knew so many students there. The weekend was wonderful. We connected with Earlham students and faculty. Saturday evening, we cooked and ate dinner with many Earlham students. On Sunday, some of us from Haverford attended the unprogrammed Clear Creek Friends Meeting that gathers on Earlham’s campus. Others attended West Richmond Friends Meeting – a Pastoral Quaker meeting near Earlham’s campus. While we were at Earlham, I visited with many people who I knew from FGC gatherings. I also surprised some Earlham students who I had met while I was on the Woolman Semester but who did not know I was going to be visiting Earlham. Sunday morning, before I went to meeting, I had breakfast with one of my Woolman Semester teachers who had joined the Biology Department at Earlham and her partner who happens to be a member of my meeting. The Quaker world is so small. On the thirteen-hour car ride home, the Haverford students shared how grateful we were to have connected with students and faculty at Earlham. We were hoping that Earlham students would come out to Haverford the following semester (spring of 2010), but their trip got delayed until this September, when students from both Earlham and George Fox University came to Haverford. The weekend gathering at Haverford in September 2010 was the culmination of the intervisitation program. The weekend’s events lasted three days. Several Haverford students and the Associate Director of the Haverford Quaker Affairs Office took the George Fox students, who arrived one day before Earlham did, into Philadelphia on Friday to see Quaker landmarks. Some of the George Fox students had never been east of Idaho. The group toured Arch Street Meetinghouse and Friends Center at 15th and Cherry Streets. At Friends Center, the group saw the recently completed green renovations on the building. They saw the new rooftop garden and the geothermal heat pump. The students also talked with Sadie Forsythe, the Young Adult Friends Program Coordinator of Philadelphia Yearly Meeting. Friday evening, after the Earlham students arrived, students from the three schools bonded as they sang songs from Rise Up Singing around a fire. Saturday events included a nature trail walk, an art activity designed to spark discussions about the Quaker testimonies, and a game of Wink. Time was spent Saturday evening in worship for students of the three colleges to share their spiritual journeys with one another and what it meant to participate in intervisitation. Saturday was my birthday, and Sunday was the birthday of an Earlham student who I know from FGC gatherings and the Woolman Semester. Saturday night, after our worship sharing, we celebrated our birthdays with cake and pie. I remember thinking how lucky I was to celebrate my birthday with so many old and new friends. For me and many others, the weekend was about finding commonalities underneath our differences. “We still found a language in common, even though we were coming from a lot of different places,” Molly Minden, a junior at Haverford and Co-clerk of QuaC, said. Molly told me that she feels our game of Wink could be used to represent the larger gathering. “Everybody had their little variations on it,” she said, “but everybody still had this game in common.” She spoke of a set of core beliefs that we all shared and said that our differences may have helped us identify our similarities. “It just seemed like a lot of people felt very comfortable talking about God,” she added. Growing up in a liberal Philadelphia meeting, I would hear about the “other branches of Quakerism.” They always seemed foreign to me. The relationships I built from these intervisitations helped me to see that we are one religious society – one rich with variation but woven with common threads.